So I went into American Eagle to return a pair of shorts, and walked out with this white kimono. I’m in love! I love how a kimono instantly adds interest and a boho vibe to any look (which is my favorite kind of vibe lol.) Also, it’s on sale! RUN! Wearing the Kari Layered necklace in gold. 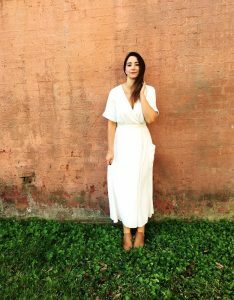 I styled this dress 3 different ways on my Instastories the other day (it’s saved in my highlights under Styling Sesh!) I love how a simple item can be used many, many ways. 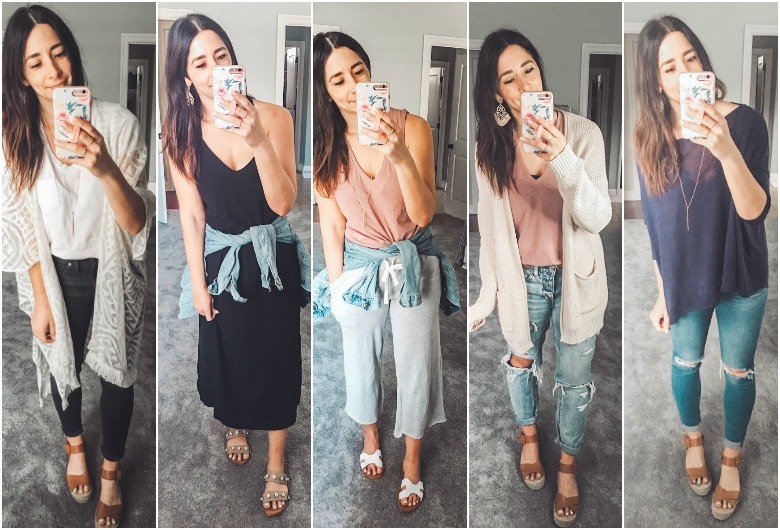 I will say over and over again, having a wardrobe full of neutral and basic items really does make getting dressed so easy. Just add accessories and you look polished. I wear them mostly at home, though, with a knotted tank and flip flops for bus stop runs. I am wearing a size small and found that they were initially tight in the hip area, but stretched out nicely (in a good way!) as I wore them. One of my favorite uniforms (see my FREE guide below!) 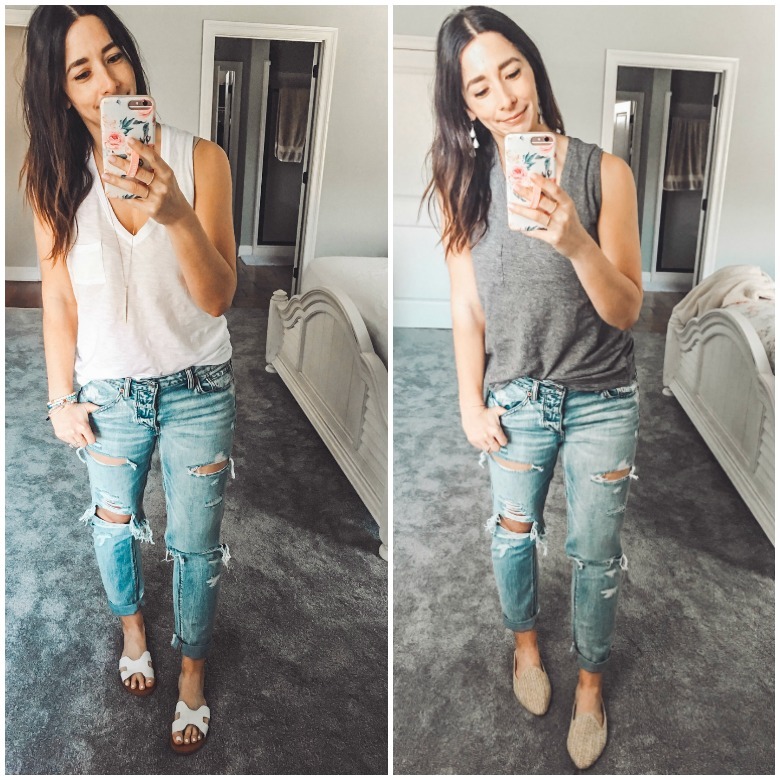 A simple tank that I own in 4 colors, boyfriend jeans, and a cardigan for chilly nights (this under $35 is EVERYTHING, I own it in 2 colors!) Also, these espadrilles that I am thinking of buying in another color. Should I get leopard, or blush? I love this Carlie poncho so much! It has a hi lo hem and drapes really nicely. It is on the sheer side, so I have tank on underneath and wear it off the shoulder! It’s hard to show on camera how good it looks in person, but I always get compliments when I wear it! Shop Stella & Dot here (I’m a stylist! ), just search the Carlie Versatile Poncho! Also wearing the Kari Layered necklace in gold. Just let’s talk about some best sellers of the week! These are the items you buy the most of! I love tracking what you like and buy, it gives me a great idea of what interest you and how to plan content here. Let’s see what you loved! 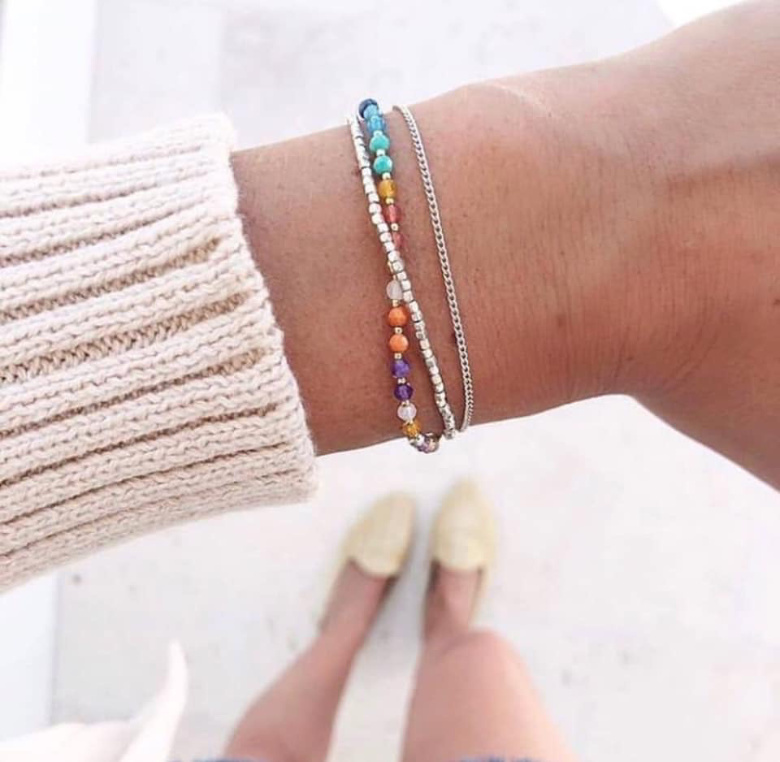 Every April Stella & Dot does a campaign to help fund Autism Awareness through the Hollyrod foundation, and proceeds from this bracelet above go to that! I have a persoanly goal to sell 25 of these in April, and I have 21 more to go! I think most of us either have a diect connection to a child with autism, or know someone who has been affected. I personally worked as an aide to children with autism for two years and these sweet kids deserve all the help, love and attention they can get. I talked about this kimono above and it is so good, I think you loved it just as much! I’ve shown off this gorgeous clutch many times over on Instastories (the lining is to DIE for), and you love it as much as I do. I have quite the collection of Stella & Dot clutches, bags, and backpacks, and I have never been disapointed! I love this Bellamy clutch for date nights, it instantly makes any outfit better. Also, can you even handle this Playa macrame version? Also, wearing this Addy poncho. It is made of a super soft sweatshirt material and is so freakin’ comfortable!